2018 returns were due April 15, 2019. 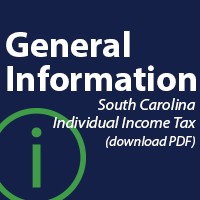 What is South Carolina Individual Income Tax? South Carolina has a simplified income tax structure which follows the federal income tax laws. South Carolina accepts the adjustments, exemptions and deductions allowed on your federal tax return with few modifications. Your federal taxable income is the starting point in determining your state income tax liability. Individual income tax rates range from 0% to a top rate of 7% on taxable income. Tax brackets are adjusted annually for inflation. 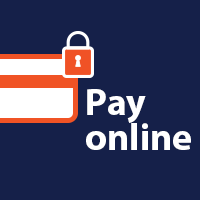 The SCDOR has implemented new security measures to ensure that fraudsters are not using your information to file a false return and steal your refund. 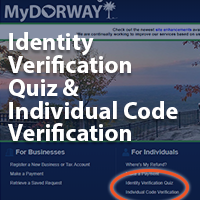 You may receive a letter from the SCDOR asking you to visit MyDORWAY to complete either the Identity Verification Quiz or Individual Code Verification after filing your return. This is just another step we are taking to keep your information private. Tax season can be stressful if you are not prepared. Use these tips to get organized, get informed, and reduce your stress. Mark your calendar. Income Tax returns are due April 15, 2019. Choose a filing system. Will you file online or by paper? Use a tax preparer or file by yourself? The SCDOR recommends filing online through a trusted preparer. 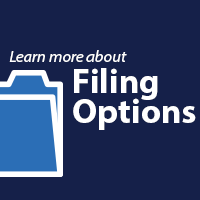 Remember that qualified SC taxpayers have the option of using several different online filing providers for free electronic filing of state and federal returns. Find our list here. Gather needed documents and information: W-2s, receipts, Social Security Numbers, and paper forms (if not filing online). Organize your documents in groups: charitable gifts, medical bills, property taxes, mortgage interest payments, or receipts. Set aside time to organize information and file your taxes. Schedule time to focus on your tax information. 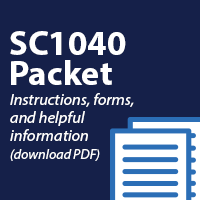 Our SC1040 Instructions packet provides detailed information for filing your Individual Income Tax return. Find this and other Individual Income Tax information in our Individual Income Tax FAQs. We are also available to assist you by phone. Give us a call at 1-844-898-8542. Taxpayers should be aware that there are some tax preparers seeking to unlawfully take advantage of unsuspecting clients. The SCDOR urges South Carolinians to be cautious and informed when selecting tax preparation assistance. You may consider contacting the South Carolina Association of Certified Public Accountants (SCACPA) for assistance in finding a tax preparer. Check the preparer’s qualifications. All paid tax return preparers must have a Preparer Tax Identification Number (PTIN). In addition to making sure they have a PTIN, ask if the preparer is affiliated with a professional organization and attends continuing education classes. DO Use the proper SC form. Make sure that the form you use is for the correct tax year. DO Include all Social Security Numbers (SSN) on the SC return and verify they are correct. DO Include all Individual Taxpayer Identification Numbers (ITIN) on the SC return and verify they are correct. If this is your first year filing a SC return after being assigned an ITIN, be sure to include a copy of the ITIN letter received from the Internal Revenue Service (IRS). DO Verify the mailing address is complete and accurate on the return. DO Mark your filing status. Generally, it should match the filing status marked on your federal return. 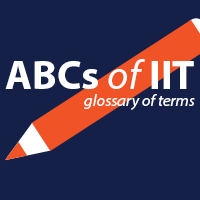 DO If completing Schedule NR, attach to the SC1040. Be sure the NR indicator box is marked on page 1 of the SC1040. DO If you file a federal or state extension, be sure to mark the appropriate box on page 1 of the SC1040. DO Make sure the amount used on line 1 of the SC1040 is the federal taxable income. DO Attach SC1040TC if you are claiming a nonrefundable tax credit. DO Include SC Withholding amount on the proper line for W-2’s and/or 1099’s. DO Attach copies of all W-2’s and/or 1099’s to support the withholding amount claimed on the SC return. 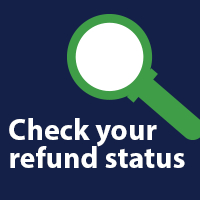 DO Complete the appropriate refund option on page 3 of the SC1040. If choosing the direct deposit option, verify the routing and account number are correct. DO If requesting a paper check, it will be mailed to the address that is shown on the return. DO Sign your return! Both spouses must sign a married filing joint return. DO Send all 3 pages of the SC1040. Be sure to include any additional state/federal schedules and documents required. DO Keep a complete copy of your SC return for your records. DON'T Claim the two wage earner credit unless the filing status is married filing jointly. DON'T Claim state withholding paid to another state. DON'T Send additional copies of your tax return. If you file electronically, you do not need to submit a paper copy. DON'T Contact the SCDOR if your refund was matched to a debt that has been reported to this agency by a claimant agency. Contact the claimant agency for information about the debt or to make an appeal. A strong password is the first line of defense for protecting your personal data online. Passwords are necessary for a majority of our online activities, including filing taxes, social networking, online banking, and paying bills. Creating complex and unique passwords help to keep your information more secure. Use a password that’s easy for you to remember but hard for a hacker to guess. You can easily turn a sentence into a complex and secure password. Sentence: My daughter Helen was born at 8:15 am. You can also use a password manager that creates unique passwords and stores your encrypted data. That way if one site is compromised, the password cannot be used on other websites to compromise additional accounts. Find more tips on online security on our Security Center. The South Carolina Department of Revenue (SCDOR) is committed to keeping taxpayer information secure and helping to educate and inform taxpayers about potential identity theft and fraud threats. Follow these steps to help protect yourself and your family. Educate yourself and your family on potential scams, phishing attempts, and how to avoid them by utilizing IRS, SCDOR and SC Department of Consumer Affairs information. Protect your personal information. Make complex online passwords. Do not use the same password for multiple sites. Keep sensitive paper documents locked in a filing cabinet. Be careful with your money. Know who you’re dealing with in any situation involving monetary transactions. Don’t send money to unestablished charities. Don’t play foreign lotteries. Don’t agree to deposit a check and wire money back. Research a company before you invest. Always be wary of unsolicited offers. Review your monthly statements carefully for any unauthorized charges. Thieves can steal your account information and run charges on your debit and credit cards. If you notice any strange charges, contact your bank or credit card company immediately. Look for more tips and information regarding scams, phishing emails, and identity theft from the US Securities and Exchange Commission, the Federal Trade Commission, the IRS, and the SCDOR. Tax return mailing addresses are listed on the form. Please use the appropriate address, including the entire zip code.